The RAIN Group Center for Sales Research (CSR) provides leaders with critical insights to support strategic decision making and sales performance improvement. Since 2005, analysts at the RAIN Group Center for Sales Research have been researching selling and buying, and publishing benchmark reports, white papers, research briefs, and best-selling books, including The Top-Performing Sales Organization, What Sales Winners Do Differently, Top Performance in Strategic Account Management, and more. 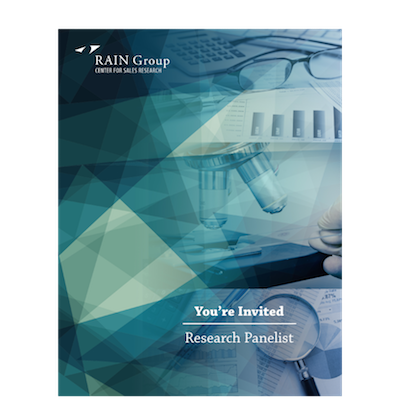 Reports, insights, and access to analysts from the RAIN Group Center for Sales Research are exclusively available to RAIN Group clients and invitation-only Research Panelists. Please note: the only way to gain access to full research reports is to be on the research panel. In return, all we ask is that you—or someone on your team—give your best effort to respond to research surveys as they are released (every few months). Complete the form to the right to join today.